Bode's Dedication on September 13, 2008 at Mason's 240th Anniversary Old Home Day was a beautiful day. Some wonderful people contributed to the occasion in honor of Mason's first inhabitant from across the Atlantic Ocean. Bode was a young enslaved African who was entrusted with caring for the cattle of Groton farmers. All alone, Bode tended their herd in Mason when it was a wilderness. During the 1730s, Bode would drive the cattle up from Groton, Mass. each spring and return with them each fall. Charles Moser of Mason Historical Society told how the Society's founder Elizabeth Orton "Twig" Jones had always wanted a statue of Bode to sit where he used to watch over the cattle. A prize-winning children's author and illustrator, Twig had researched about Bode, and used to tell his story to Mason schoolchildren. 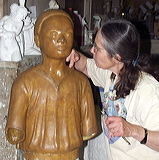 In memory of Twig, the Historical Society commissioned Liz Sibley Fletcher to make Bode's statue life-size. Thanks to a grant from the Frederick W. Cox and Dorothy Thurber Cox Memorial Fund of the New Hampshire Charitable Foundation, and to donations large and small from Mason community members and friends far and wide, Bode was able to be cast in bronze! Paul King Foundry of Rhode Island did an excellent job. Local contractor Bernie O'Grady donated his skills and time to mount Bode on his rock in Mason's village center. When Bode was unveiled, story-teller Brother Blue brought him vividly to life. Centuries of time vanished as Blue spoke directly to Bode, his suffering and strength became real. Trying in vain to break real slave chains, Brother Blue called upon everyone to use the power of love to melt the chains upon our hearts and minds. Then Valerie Cunningham, founder of Portsmouth's Black Heritage Trail, spoke about New Hampshire's black history, including how African Americans confronted discrimination in New Hampshire during the Civil Rights era. In 2008, Valerie was named a Restore America Hero by the National Trust for Historic Preservation. Bode was welcomed back to Mason in fine style! You can download A History of Bode and of His Statue, a 13 page 2.3 MB PDF document describing what is known of Bode's history, the Mason Historical Society's project to commission a sculpture, and some comments from the sculptor.